In the first of our two-part series on getting creative with a social intranet, we shared tips on involving audiences and creating multi-media content to drive traffic back to the intranet. Here’s part two which focusses on creative writing, drawing parallels with external social media and measuring success. Write features – If all your stories are straight reporting, why would your audience feel inclined to get online when they could be using that time to grow the business or help customers? Newspapers and magazines have regular columns to draw in their readers and give a different perspective to hot topics, so take the same approach. We recently wrote a series of stories called ‘What’s on my mind’ that tapped into the minds of people across the business to share their personal insight and top tips to raise the profile of a new customer complaints system. Their stories were much more engaging than the planned long technical updates. We also encourage ‘bright spot’ features, stories that showcase that change is underway and where it is going well. Draw parallels with social media – The majority of audiences are probably up to speed when it comes to facebook, linkedin or twitter. Encourage audiences to draw parallels with external social media channels and bring that knowledge inhouse to your organisations intranet. For example, why not use the #FollowFriday trend on twitter and do it on your intranet? It’s a great way to shine the spotlight on new contacts you’ve met around the business to your internal network. Set ground-rules – Protect your organisation and people by being clear on what should and should not be shared on your intranet, particularly customer data. 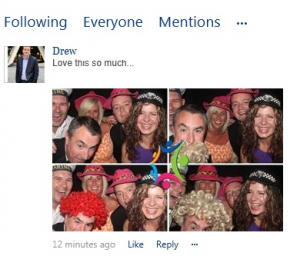 In one company, we observed a global function launch Yammer, a lot of work went into the launch but the third post was a criticism from the boss. The channel soon became known as ‘hammer time’ and dissolved! So, while the online conversations should be self-governing, set rules for what you want to see using positive reinforcement. But do it in a tone that reflects the core purpose of a social intranet – friendly, warm, two-way, conversational. Make sure you measure – It doesn’t matter if you only have basic analytics, take whatever you can get. While numbers only give an indication of click-through rates rather than understanding, they’re a helpful benchmark. Don’t forget to measure social interaction either. We worked with a client whose intranet analytics were very limited. So we tracked the level of social interaction in response to articles via #hashtags and comments left on stories during the rollout of a major compliance and change programme. In some ways this was more powerful because we could track the mood of the conversations and share that with senior leaders to help shape next steps and future communications. Create action – When creating content for the intranet, ensure it answers the question “What should readers think, feel or do”, and give people a channel for letting you know if they were moved to take action. Following the launch of an ezine to support a global change programme, one reader emailed in and said he was so inspired after his read, that he immediately went online to complete his elearning modules. So, whatever it is that’s on your radar for improving the channels mix, we hope you’ve been inspired. And of course, if you need a helping hand to implement changes and want employees to join you on that journey, we’d love to help.